What’s Involved in a Firearms Background Check, Anyway? The intense battle over universal – or not-so-universal – background checks for firearms purchases further illustrates the deep cultural divide over guns, pitting those who see the checks as a profoundly obvious common-sense step to stem the supply of deadly weapons to criminals and the violence-prone against those who see it as an expensive hassle that will inconvenience legitimate gun owners while doing little to keep guns out of the wrong hands. But what’s involved in a background check anyway? The process – currently conducted whenever a federally licensed gun dealer sells a gun – begins with Form 4473, a Bureau of Alcohol, Tobacco, Firearms and Explosives record that gathers demographic information and asks a series of questions to determine if a would-be buyer is barred from possessing a gun. 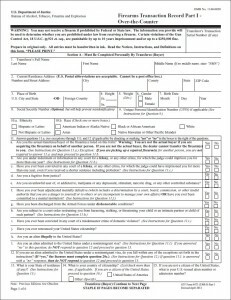 Perhaps the most significant is the first, asking: “Are you the actual transferee/buyer of the firearm(s) listed on this form?” That question is designed to ferret out “straw buyers” – individuals with clean records who are buying a gun on behalf of another person who cannot legally acquire weapons. Gun store owners have told tales of young women coming in with detailed sketches of the store’s display cases and then pointing to a weapon matching a spot marked on the sketch – a scheme, the owners presume, to obtain a weapon for a boyfriend with a criminal record. It is illegal to falsely answer the straw-buyer question, but it is still self-reported and the intuition of the store owner is the only guard against a lie. Buyers are also asked if they have ever been convicted of a domestic violence crime or a felony or any criminal charge that carried a possible sentence of more than one year in prison. Other questions ask about restraining orders, drug use and commitments to mental hospitals. Those answers, too, are self-reported, but licensed gun dealers don’t take a buyer’s word for it. Instead, they are required to submit the buyer’s name to the National Instant Criminal Background Check System, known as NICS. The system, managed by the FBI, searches criminal records and other sources to determine if the prospective buyer is disqualified from owning a gun, typically for the reasons listed on Form 4473. The background check is often nearly instantaneous. But if the check turns up a possible match to a prohibited person, the system will instruct the dealer to delay the sale while the information is checked. If a resolution is not reached within three days, the dealer has the option to go ahead with the sale or wait for authorities to complete their investigation. The NICS check was mandated by the Brady Act in 1993 and went live five years later. In the more than 14 years since, the FBI says 166 million NICS checks have been performed, resulting in more than 1 million federal denials, most often as a result of criminal convictions. In Connecticut last year, 237,496 background checks were performed. That background check is not required when individuals who are not federally licensed gun dealers sell weapons informally or at gun shows or when weapons are transferred between relatives. This week, two U.S. senators, Republican Pat Toomey of Pennsylvania and Democrat Joe Manchin of West Virginia, released a proposal to extend background checks to all sales at gun shows, over the Internet and between strangers, while continuing to exempt “personal transfers” between relatives and friends. That proposal brought a swift rebuke from gun-rights advocates, who have generally pushed back against expanding background checks. The Newtown-based National Shooting Sports Foundation, the gun-industry trade group, opposes expanded checks, while simultaneously calling for improvements in the NICS system. Currently, states are inconsistent in the quality of the data they report to the system, and the foundation advocates pressuring states to provide more information. “Before we talk about requiring background checks on private party transfers, we should fix NICS,” the group says. But what’s the harm in running more background checks, even if through an imperfect system? The NSSF says the proposal will burden licensed firearms dealers who will have to run the checks for private sellers, possibly for a mandated fee that doesn’t cover their costs. Dealers also fear that expanded checks will overtax the system and lead to delays in completing their own sales. They also share a fear among some gun enthusiasts that the government might use the system to compile a registry of gun owners in the country, which some believe could be used by tyrannical leaders to disarm the nation. In a nod to those worries, federal law requires the government to destroy any record of a NICS check by the next business day. Gun-control advocates say those are small prices to pay to limit the flow of guns to those barred from owning them. “This bill will not only help keep guns out of the wrong hands, it will help save lives and keep our communities safe,” New York Mayor Michael Bloomberg said in a statement. That pitched battle now moves to the Senate, where members voted Thursday morning to block a filibuster and move forward with consideration of gun legislation. How exactly does the Federal government enforce a background check between two private parties? Given the current NICS law the record of the check is destroyed in 24 hours. So a year after a private sale, between two parties occurs, not only could the government not even tell the gun was transferred if they suspected it they couldn’t prove a background check didn’t occur because the record was destroyed. The only way the current system “sort of” works is that the FFL is a licensed third party that has no interest in not running the check and keeps a local record of the transaction. I don’t object to the NICS check which is mandatory; but how can we be *sure* the government is destroying this info within 24-hours? I don’t believe our government ever destroys any bit of information. Me neither just ask the farmers/ranchers that were enlightened to there private info given by EPA to a wacko enviormenalists group..Whoops said the EPA it was an oversight and wont happen again.BS. Assume the Boston Marathon bomber is not holed up in Watertown, MA – but Watertown, CT. You are a law-abiding individual and this crazed, armed Muslim bomber is running toward your house. What weapon would YOU CHOOSE to defend yourself with? I would pick option 3. Our legislature does not give us that option. My advice – aim well and pray. In response to Wall, the choice is largely irrelevant. According to FBI records there are over 400,000 robberies annually. I don’t recall any reports of a legally armed civilian stopping a crime. NOT A SINGLE ONE. The reality is that there are many law abiding citizens with guns. When a crime occurs there is no evidence they will “see something and do something” or any similar action. While I support the Second Amendment and our right to bear arms with reasonable restrictions, there is no belief that they will make things safer for the rest of us. and daintily peruse a copy of the American Rileman magazine (available at your public library, nearest gun club or even a friend). You will find a whole series of newspaper articles reporting the events and outcomes of self-defense and crime supression by civilians. The test is whether or not you will admit to being correctly informed and updated. Oops. A spelling error: It’s the American Rifleman Magazine. Rather great write-up. I merely located a person’s blog site as well as planned to say that I’ve genuinely loved shopping a person’s website discussions. Whatever the case I am opt-in as part of your give food to exactly what praying you’re once more soon! It’s a nice beneficial part of details. I am just content you embraced this handy information and facts around. Make sure you keep us up to date in this way. Appreciate spreading. Hi all, You may have conducted an admirable job. I’ll absolutely reddit them and in my recommend in order to friends and neighbors. I think they’re going to be took advantage of this site. I was advised this site by the relation. We are will no longer specified irrespective of whether this text is definitely created by him or her while nobody else acknowledge this kind of comprehensive concerning my own issues. You are awesome! Cheers! written and come with almost all vital infos. I would like to look extra posts like this . Woah your blog is superb i like mastering your posts. Continue being the great pictures! You already know, lots of people are shopping for this info, you could assistance these people considerably dream girl escorts bangalore. I really don’t accept as true with this blog post. Nevertheless, I did looked in Yahoo and I have found out that you’re correct and I was thinking in the improper way. Carry on publishing great quality material like this.